This was my first time making peanut cookies; and I know I didn’t do a good job making it– the peanuts were still too coarse (I should have used a coffee grinder instead of food processor), and I forgot to toast ground peanut. So the cookies came out just okay for me… I have been trying to lure my kids to eat more peanut cookies because I know this will be the last Chinese New Year snacks sitting on the kitchen counter. Grind peanut until fine. Then toast in dry clean pan on medium low heat until it browns and the peanut aroma comes out. Be sure to stir constantly to prevent burning. Cool completely. In a large bowl, combine all ingredients and mix to form a dough. Put dough on a flat surface and place a piece of plastic wrap on the top, roll the dough to 8mm thickness. Use a mini cookie cutter to cut out cookie dough. 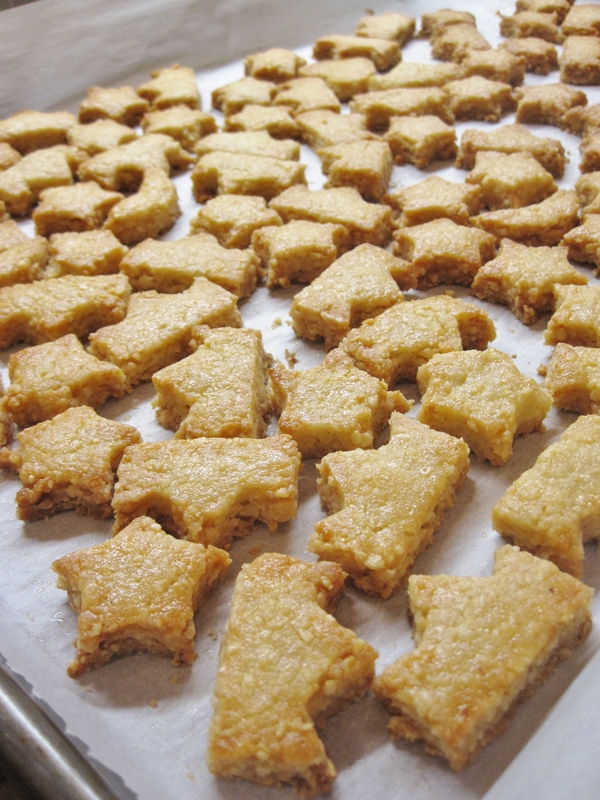 Lay cut cookies on a baking pan lined with parchment paper. Brush egg wash on the top, and bake at preheated 340°F oven for 18-20 minutes. Cool cookies on the pan completely then store in air tight container. Egg wash: I didn’t want to have residual beaten egg from the egg wash, so I brushed the top with heavy whipping cream (just happen to have it in the fridge) instead. And the result wasn’t too bad– the top of the cookies has the sheen look.